As part of its architecture redesign, Angular was made modular. This feature allows you to install individual modules, thereby also allowing you to skip unnecessary modules. However, Angular insists on using TypeScript as a way to ensure type safety in the app. 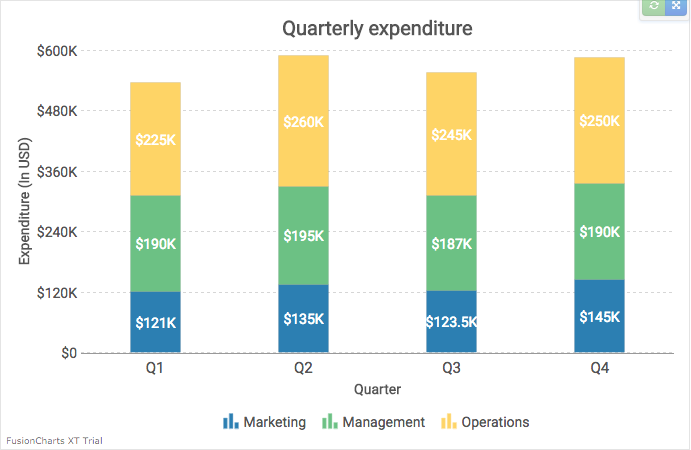 FusionCharts offers a ready-to-use Angular plugin, which allows developers to integrate the charting library with Angular. Eliminating the need to create the component from scratch. The FusionCharts library currently accepts data in JSON and XML only. As such, we need to convert data in a format accepted by the library. For this AngularJS chart example, we will use JSON. Since we are visualizing a part-to-whole data set, we will use a Stacked Column Chart. To get started, you need to install the FusionCharts-Angular2 Component using npm. Now we need to create the chart component. The component adds the <fusioncharts> directive in the Angular app. The detailed chart configurations along with the data in JSON format is added to the component. We now make a call to the <my-app> component that we created in Angular. When the <my-app> component is referenced, the AppModule function would get triggered. This would then import the FusionChartsModule thereby rendering the chart using the chart component that we created. Alternatively, you can experiment with our codebase on Plunker. If you still face issues with the implementation, you can reach out to us for support. Hey Robert, it would be more apt to say that AngularJS was developed at Google. As a by-product of the Google Feedback Tool. Misko Hevery and Adam Abrons (the inventors of Angular), were part of this team when they developed Angular to simplify the development process. The framework has ever-since been maintained by Google.